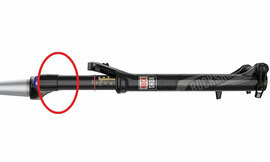 Fork technics - this is why! - cornelius-kapfingers Webseite! Fork technics - this is why! Structure - why upsidedown ? Upsidedown is the new right side up ! In the past this forks have been heavy, too flexy, hard to get. The positive aspects dominated my decision to go upsidedown. The higher fore-aft stiffness was the crucial point. The highest stanchion diameter is at the area of the highest stress. Just imagine, there is a really heavy bird sitting on a limb. The limb will move down a little bit due to the high mechanical stress he gets. The red marked area is the point with the highest diameter on the limb. Maybe you can imagine now, why upsidedown? If you ride hard you will not feel a flexy system at the upsideownfork. The wheelbase does not change that much under hard braking or high loads. It provides the same stiff feeling you would have with a double crown fork - but with a singlecrownfork with a low weight. This is a improvement just because of the construction. The wall thicksnesses are really high on the crucial areas. 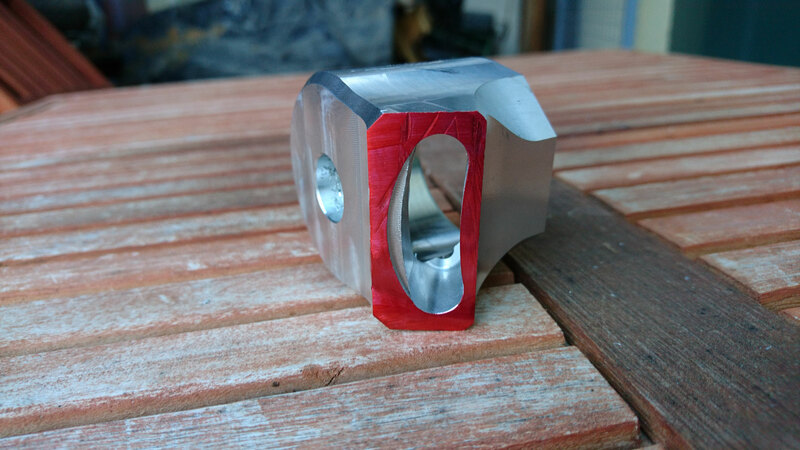 Up to 3mm with a diameter of 44mm at the stanchions, about 5-6mm for the crown. this makes it also stiff for torsional loads. Most of you guys were "not amused" about the introduction of inner tubes with a golden coating beginning with Mai 2018. There are several reasons for the so called Gold Slide Coating. 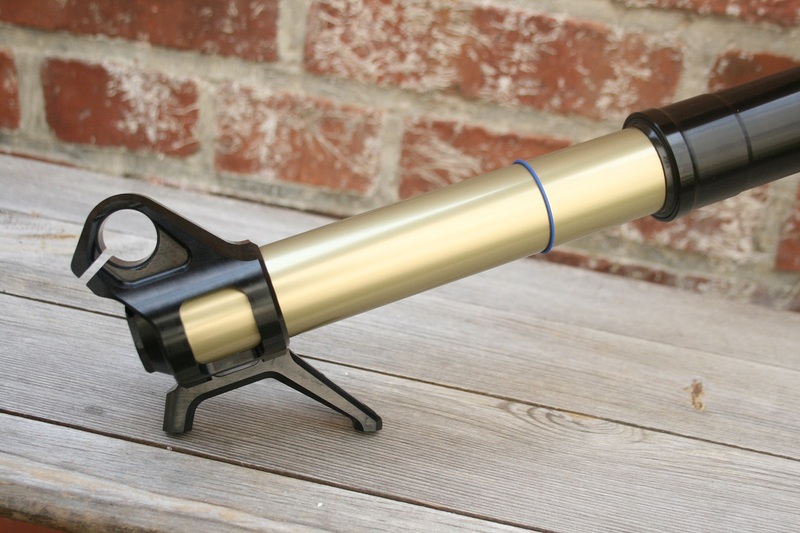 For this you have to know something about the anodizing process and the way how black stanchions get black. The real and natural hard coating has a gold/brown color. Like trees have green leafs, hardcoated aluminium has gold/brown surfaces. This surface is the best way for this purpose. All things in the past, e.g. nitrid coating, or DLC coating, or "Espresso" coating ... all of them failed. 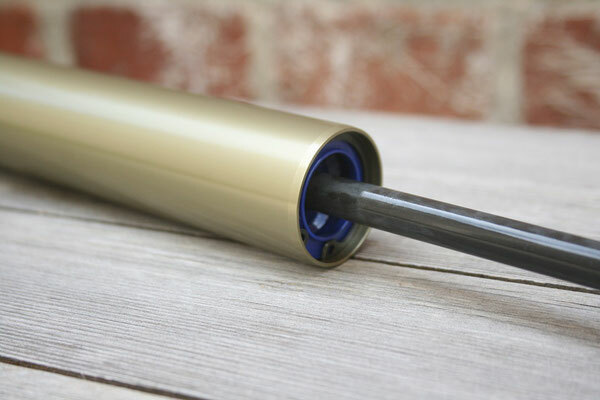 The black anodizing follows one simple princip: the first treatment every black anodizing gets is a gold/brown hardanodizing. Afterwards it becomes colored in black. This means, the black color is only an additional coloring of the natural color. As you can imagine, the colored tubes are always worse than without extra coloring. Lot of suspension companies have problems with the wear and the friction of black tubes. They do not last that long as the Gold Slide Coating. This is the main reason for the decision to go with the natural - technical color of the hardanodizing - you will love it! Air spring - is it as good as coil? It's like catholics and protestants. Everybody has his own belief - my one is air spring. With a large negativ air chamber you can reduce the "hump" in the curve at the beginning. This was the problem of the first air spring systems. 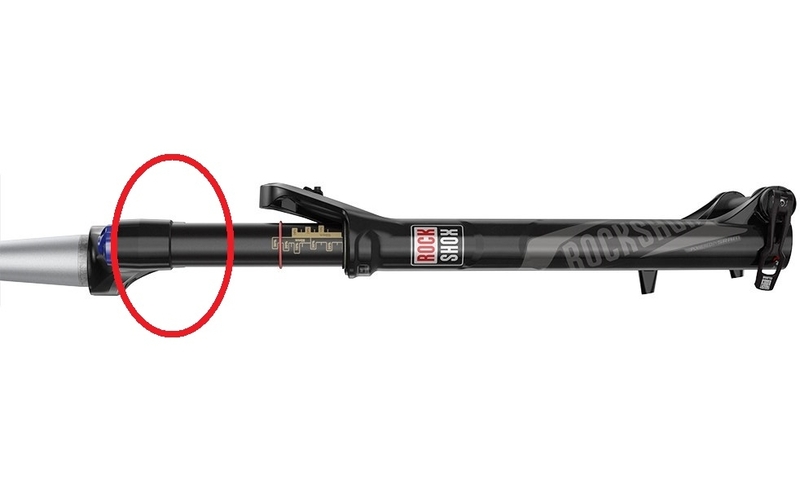 After a while Rock Shox and Fox came up with "Debon air" or "Evol" and improved this mistake a little bit. All Intend forks had this long negativ chambers from the beginning on and they are even LONGER than comparable chambers from Debon air and Evol. This is why the spring curve is that perfect and gives you lot of senitivity in the beginning and a lot of support in the middle. Furthermore air springs have the big advantage, that you can adjust it on your weight or riding style. If you're 50 kg oder 150 kg - doesn't matter! Wanna have a hard fork ? No problem! Wanna have a soft fork with more progression ? Yes it's possible! You can also easily change the travel of the Intend air system with Igus bushings or any other spacer. Damping - semi open bath! 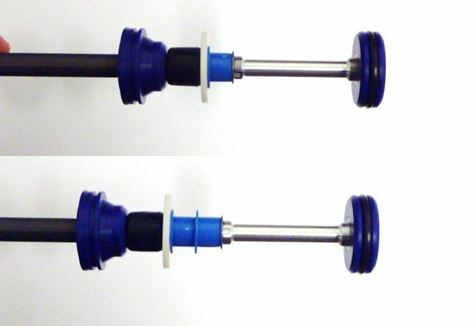 At some forks the damping system is the most service intensive part. You can find systems with bladders and pistons at the competitors. For this you have to know: On every seal can trespass oil or air, you cannot avoid this - its not possible. A seal is not 100% working. For systems with pistons there will always be a small amount of air coming in the oil. For systems with a bladder there will always be a small amount of oil which comes into the cartridge from the outside. In this case the total volume of the oil IN the cartridge raises, the bladder expandes, in some cases it crackes. So that's why you should make a service some time. For my semi open bath system this trespass of oil and air also appears - you cannot turn out physics. But you can find a solution which works anyway! Normal open bath systems are heavy as hell, because they have that much oil volume. 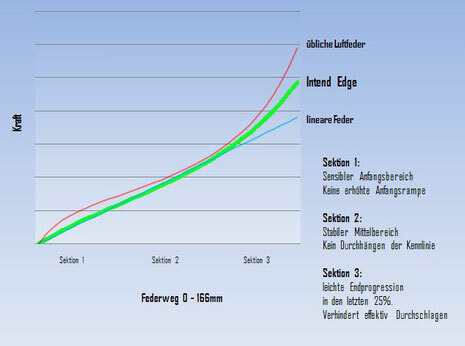 In the Intend Edge there is only 80 ml of oil and 100 ml in the Inifinty. This keeps the unsprung mass low. How is this possible? This is the damper dummy. 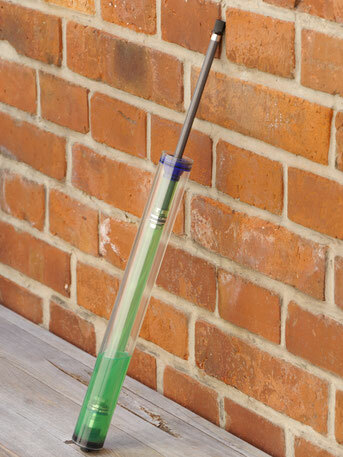 You can see the oil in the cartridge tube and the oil in the outer tube. Normaly the oil in the middle would flow down and equal to the level of the outside oil. Every open bath system has a bleeding hole at the highest point of the cartridge. In the Intend system this hole is closed with an O-ring, that air and oil can come out, but nothing can come in. This is why it is possible to reduce the oil volume to a minimum of 80ml (about 70g) without any disadvantages. And you can easily change your compression setup by changing shims. Just turn your bike, unscrew the compression-unit, change the shims, and install the unit again - no bleeding neccessary, the system bleeds itself! 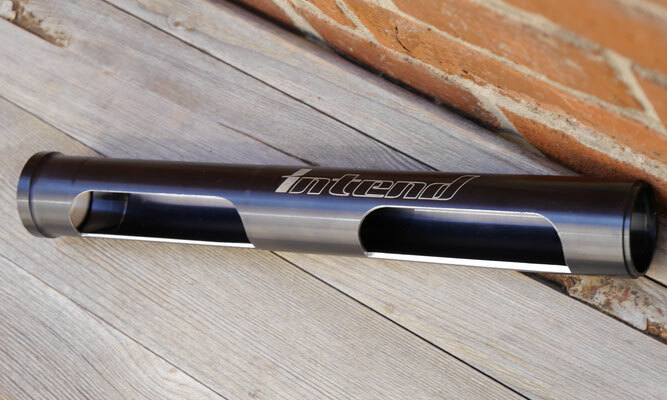 Enjoy a controlled and service free ride with the Intend damping system! 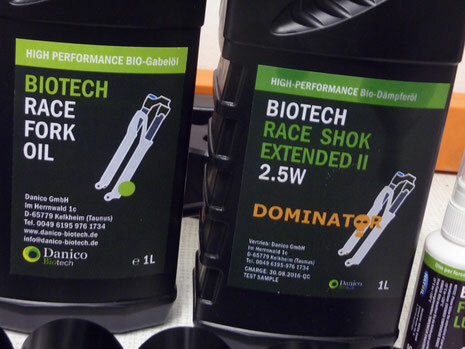 The damping oil is 2,5WT of Danico Biotech "Race Shock". It uses renewable sources, and does not get over 60° C even under hard riding.It also cannot get "old", because there are no additives inside, which can get damaged.